Welding is a powerful fabrication method, but it can pose a number of hazards to any metalworker who lacks experience or caution. But one critical hazard that can be overlooked is indeed one you can’t see: toxic gases that can fill up a room without adequate ventilation. Since these gases can be hard to detect with human senses alone, a safe welding environment should make use of a gas detection monitor. Gas detection monitors sense 1 or more toxic gases (or a deficiency of oxygen) and alert the user when levels exceed a safe threshold. Rather than guessing the safety of an environment based solely on a person’s sense of smell (which can vary greatly from person to person), gas detectors use sensors to detect actual concentrations of the toxic vapor and offer such safety features as piercing multi-directional alarms to ensure the user is alerted even in noisy industrial environments. Thankfully these tools are required by law to keep employees safe during welding applications (particularly small spaces where gases can accumulate rapidly) and in other noxious environments. And while fixed systems are appropriate for permanent installations, a welder may work in a variety of locations or a multi-purpose shop. In that case, portable gas detection monitors are ideal: pocket-sized devices—some are even equipped with belt clips—that ensure that the sensor readings reflect the saturation levels at your exact location in order to keep you safe and informed, whether you’re in your regular work space or an off-site job. Single-detection units are a cost-effective option if you work around or only need to keep track of one vapor (for example—as with the RKI Instruments 03 model—oxygen, hydrogen sulfide, carbon monoxide, or flammables. You select the gas you’d like to monitor and that detector will only have that option. An upgrade to the standalone single-detection unit is interchangeability. Single toxic gas detectors with this feature still monitor only one gas at a time, but sensors can be swapped in and out to monitor different gases as appropriate to the environment and application. RKI Instruments’ SC-01 offers 8 different sensors for a variety of toxic gas detection needs. When it’s important to monitor multiple toxic gases along with oxygen saturation levels, a portable gas detector capable of sensing more than one substance is the best choice. 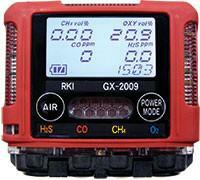 The RKI Instruments GX-2009 senses O2, H2S, CO, and LEL simultaneously, all in a durable water-, dust-, and impact-resistant housing for safety in some of the most hostile environments. Welding is mission-critical across a number of industries that rely on fabricated metal. And that’s why safety must get the utmost attention. Portable gas detection monitors are an essential ingredient in keeping yourself—or your employees—safe so the job can be completed.